This month the builder's page features an American style model designed by Fred Schlipf of Urbana, IL, USA. 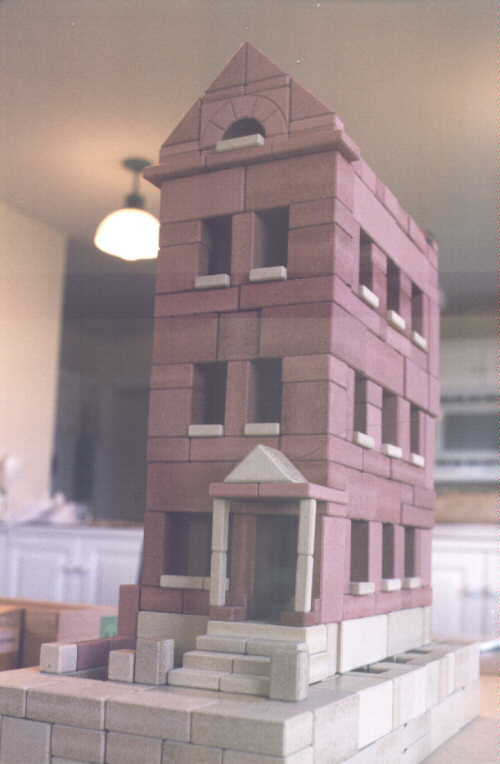 He calls it a "three flat apartment house with basement"; I call it a "brownstone". It was built with a set # 12, just 499 stones available. One of four such American style designs he has made for this set. Two of these designs were shown on this web page in April, 1998. The other three designs are available in the new CVA booklets of building plans for set GK-NF # 12. Let me add a request for more pictures. I would like to use them for the "builder's page". I have a good selection of old pictures, but I prefer to feature modern builders. The set # 18A is going to be a reality very soon. I expect to have them in hand by June, if not a little before. The order for sets is already in. Remember, this set introduces the Gothic arches in three different sizes. This set contains 230 stones. I have no pricing yet, but I expect to see the set at the CVA meeting this month. The new CVA booklets of building plans for set GK-NF # 12 available. It costs $15.00, post paid. Remember that with a purchase of an Anchor set from # 10A and above, including the new 16A, this set of books costs only $10 extra, if I can pack the books in with the set (that is, not mailed to another address). The next CVA meeting will be on Saturday, April 20, 2002. Not only will I be there, but I am expecting another American CVA member to be there. I'll not mention his name as I do not want to jinx his plans. See the CVA page for details. The CVA has published a Stone Catalog, and I have none left (in the correct European binder -- $30, ppd), and I still have one of the correct European binders. I expect to bring home some more copies at the end of April. And I have one old, bound copy (no supplements possible) if you cannot wait. That one costs just $20, postpaid; I keep it here as a backup. Yes, I have an upstairs and a downstairs copy of the CVA catalog, but don't even think about them. If you already have a catalog and want a binder, it will cost $7.00 (It's a $3 binder, but it needs special packaging to get to you without damage.) Even if you have no other Anchor reference book, you need to buy this one. It is not available on CD-ROM, and the next update will not be available for at least six months. The update is concentrating on the contents of the unusual sets. The amount of detailed information is very great, and the information keeps coming in. And it has become clear that e-mails with just numbers will not do; Leo Coffeng must receive a photocopy or scan (in color if at all possible) of the packing plan. Sets and puzzles are being produced again! The quality is high. I urge people interested in starting Anchor building, and those who want to provide their educational benefits to their children, to consider buying new puzzles and sets. Also I may have available a limited selection of old sets (including notes on additions to my own collection), including a new set and some special prices. Anchor Stone Building Sets are great presents, and the supplement sets make wonderful follow up gifts. These new sets recently won the 1997 Parents' Choice Gold Medal. In 1999, the Anchor sets won the National Parenting Publications Award. For an 1880 toy to win in 1997 and 1999 says a lot about the quality of these sets and Anchor in general. These sets are a perfect supplement to computers. I saw the set # 16A and expect that they will be here ready for shipping before Thanksgiving. Order now if you want one. The quantity will be limited. The CVA has published its Stone Catalog, which covers all of the stone shapes Richter made, plus shapes made by other innovators. Metal parts and most other accessories are included in the catalog. The contents of the sets are also listed. I have only one here in the USA. If you are thinking of getting a Stone Catalog, you had better act now! CD-ROM Archive: I can supply the CD-ROMs of the CVA's CD-Archive. More scans are being added all of the time, and the "holes" in the documentation are being filled. Of course, more scans means more CDs, and as scans are added some files are moved to other CD. As of today, there are nine CD-ROMs in the Archive, plus, for CVA members only, 6 additional CD-ROMs of the old MLBs. (Do not try to buy these MLB CD-ROMs unless you are a CVA member. I check the membership list.) All of the scans are JPG files. # 1 contains the GK-NF building and layer plans, excluding # 34, plus odd things like box covers, figures, insets, rulers, etc. ; # 2 contains the DS and # 34 building and layer plans; # 3 contains all packing plans and catalogs; # 4 contains the building and layer plans for the second series of GK-Br and Imperator, the VE series; # 5 contains the KK building and layer plans and the web site from its beginning, but the web site file grows and will have to be relocated by autumn; # 6 contains documentation including my book in both English and German and various magazines (like the Anker Zeitung) and magazine articles; # 7 contains the building and layer plans for the series 100 (Neue Reihe), 200 (Modern [American] House Series), 300 (Landhaus [Country House] sets), 400 (Festungs- und Burgen-Baukasten [fortress and castle sets]), NS, Capital, Täfelchenlegen, mosaic sets, games, EF (first series), VEB, Imperator (all metal), LaVelle; # 8 contains the building and layer plans for the series GK-AF, A-B (American Bridges), Comet, Eagle, Eisenbrücken, and the first series of GK-Br and Imperator; # 9 contains Orion and various additional documentation like advertisements, exhibits, factory (including Rudolsbad), Richter (includes his will and other documents regarding his estate), Rudolstadt, other products (like Lebkuchen, medicines and mechanical music instruments) and # 10 Personal Designs. I had to move the Personal Designs to another CD-ROM. I continue to scan more books and add them to the CD-ROM Archive. Only the members of the Club of Anchor Friends are permitted to purchase the six CD-ROMs containing all of the MLBs, including both the English and the German language translations. If you want to buy one or more of these CD-ROMs, please send $2 (or euros, your choice) for the first CD-ROM and $1 each for the rest -- postage included, no matter where they are going. CDs are inexpensive, so I do not see a problem if, at this stage of the Archive, some CDs may become obsolete due to relocation of files. add a Dutch mail order retailer. For the month of April, 2002.